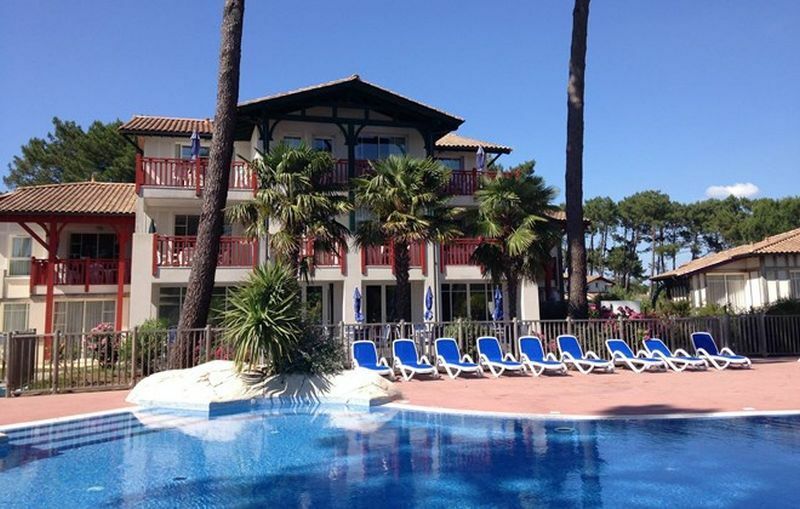 Directly on the golf course (9 and 18 holes) of Gujan Mestras lies the luxurious holiday park "Résidence Les Greens du Bassin". The park has a rich vegetation and is built in the typical architecture of the region Les Landes. The golf course offers a golf club and training center with opportunities for courses (with discount for guests of residence Odalys), electric golf carts, golf trolleys, rental of equipment, a boutique, restaurant with terrace overlooking the lake of the golf course and a TV room. The cozy villa with a garden, terrace and private outdoor swimming pool (not heated, open mid-May to mid-September) is 5 km from the marina and the beach of La Hume. The 3 room house is for a maximum of 8 people and covers an area of ​​70 m2. The houses are connected in blocks of 3 to 5 houses and have a ground floor and first floor. The house is spacious, pleasantly furnished and fully equipped. The house has a spacious living room, a kitchen corner, two bathrooms, a separate toilet, two bedrooms and a terrace. The living room has a dining area, a double bed sofa and a TV. The kitchen is equipped with electric hotplates, a refrigerator, an oven, a microwave, dishwasher and a washing machine. A bathroom has a toilet. The second toilet is in a separate room. The first bedroom has a double bed. The second bedroom has two single beds. The last two berths are located in an alcove on the ground floor or the first floor. This can be a bunk bed or two single beds. The terrace is equipped with garden furniture. Bed linen is included in the price. The villa is built in a regional, traditional style and is only 5 km from the marina and from the cozy la Hume beach, near the golf course, surrounded by luxurious vegetation close to the clubhouse. You can use a non-heated outdoor swimming pool for the whole residence, open from mid-May to mid-September, there is bike rental, there is WiFi internet in the apartments. You can borrow an iron and ironing board. At Gukjan Mestras you will find a golf course with special prices for guests of Odalys vacationers, you can also rent a bike for your active holiday. For an additional fee you can reserve a baby package with bath, bed and booster seat, a set of towels, bed linen change, cleaning kit or final cleaning. Bed and bath linen is provided. A deposit and tourist tax must be paid on arrival. The deposit will be returned to you on the day of departure after the inventory or by mail the following week. The accommodation must be left spotlessly clean on departure, this is not the case, you will only receive a part of the deposit back. Pets are allowed for an additional fee provided they have a valid vaccination certificate and tattoo. Dogs must remain on a leash. Besides golf, this area offers a wide variety of attractions and activities. Nature in this area is an eldorado for bird and nature lovers in the Bay of Arcachon, the dune of Pyla with 2700 m. Length and 105 m. Altitude or the bird park with the special bird huts. For water sports enthusiasts there is also plenty to do such as sailing, surfing, catamaran sailing, water skiing and jet skiing. But also horse riding, cycling, walking, paragliding, tennis and fishing are activities that are possible in this area. The city of Bordeaux is about 55 km. distance. There are plenty of other characteristic coastal towns with their ports on display. For children there are also many trips possible. You can think of for example Aqualand, an area of ​​8 ha with all kinds of water games and attractions or the zoo of Coccinelle with 800 animal species, a playground and a small train or Kid Parc, a playground for children from 2 to 12 years. In fact, this environment offers unlimited possibilities for every age. Take the miles of sandy beaches of Les Landes and your holiday is complete.